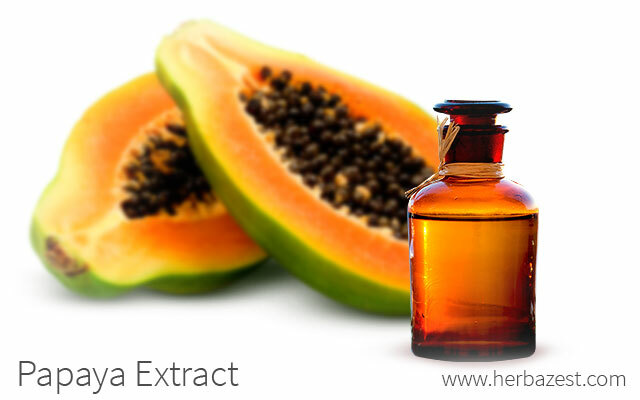 Papaya extracts are powerful treatments that contain therapeutic healing properties for the human body. Indeed various parts of the Carica papaya tree have been used by traditional healers and practitioners for centuries. In recent years, through careful analysis of its bioactive constituents, modern science has corroborated some medicinal uses of papaya extracts. First prepare the papaya skin by thoroughly washing its surface. It may be helpful to use a handheld scrubber. Next remove the skin of papaya with a sharp knife or vegetable peeler, making sure to leave at least a thin layer of fruit flesh on the underside. Place the papaya peels in an airtight glass container and cover with vodka. Fasten the lid and store the papaya extract solution in a cool, dark place. The medicinal potency of this papaya extract increases with time. About two daily doses of 30 drops each are recommended. Similar papaya extracts can be made using the skin of an unripe green papaya, as well as from the leaves, bark, and seeds of the papaya tree. What Is Papaya Extract Good For? Papaya is widely known by herbal practitioners for its ability to lower inflammation. This healing quality has earned it considerable clout as an experimental treatment for arthritis sufferers. It is also active in breaking down proteins and improving digestion. When regularly consumed the herb serves as a mild laxative, and helps relieve symptoms of irritable bowel syndrome. The benefits of taking papaya extract don't stop there. Its antibacterial and antiviral properties strength the immune system and protect the body from harmful pathogens. Papaya extracts also help to lower blood sugar and cholesterol levels in the body, and have shown efficacy in the treatment and management of diabetes. Some research has even recorded a marked increase in red blood cells and platelet count following regular treatments of papaya extract. Supporting the flow of oxygen to the lungs and detecting signals from damaged blood vessels, these are the basic biological building blocks of healthy blood. Papaya extracts are healing elixirs with potent medicinal action. When proper dosages are observed, they can be safely prepared and consumed at home.